DOUBLE DREAMYARD AND DOUBLE FALSE PATTERN!!! - Modist Brewing Co. DOUBLE DREAMYARD AND DOUBLE FALSE PATTERN!!! WHOA OMG HOLY MOLY WOW. We’re excited to announce a very special very limited DOUBLE DOUBLE RELEASE. 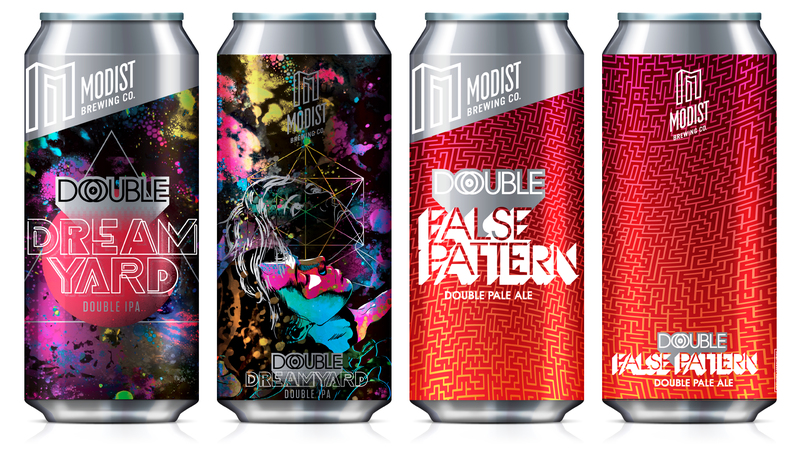 Double Dreamyard Double IPA and Double False Pattern Double Pale Ale are ready to hit select liquor stores on Monday, July 2nd. Both beers will also go on tap at Modist this Saturday June 30th at noon. Double Dreamyard is our award-winning exceptionally-rated juicy, hazy IPA that’s made entirely from oats and wheat and heavily hopped with Citra and Denali but, like, doubled. We took Dreamyard and overloaded it with everything: extra oats, extra wheat, extra Citra, extra Denali, and pumped up the ABV to 8.5%. The end result is a crazy smooth juicy whale of a DIPA that’s, like, really good. Double False Pattern is our exceptionally-rated soft, hazy pale ale that’s made from oats and heavily hopped with Mosaic but, like, doubled. We took False Pattern and overloaded it with everything: extra oats, extra Mosaic, and pumped up the ABV to 7.5%. The end result is a crazy smooth juicy whale of a Double Pale Ale that’s, like, really good.